The Delaware Chamber Music Festival continued its celebration of the music of Johannes Brahms June 23 through 25 with complementary works by Beethoven, Stravinsky, Mozart and Turina. The Festival Quartet includes: Barbara Govatos, violin & DCMF Artistic Director; Hirono Oka, violin; Che-Hung Chen, viola and Clancy Newman, cello. Guest artists this season were: Kristen Johnson, viola; Marcantonio Barone, Julie Nishimura & Natalie Zhu, pianists; Douglas Mapp, bass; Tina Betz, voice and Jonathan Whitney, arranger and director of Boysie Lowery Living Jazz Residency. Friday, June 23’s concert opened with a performance of Beethoven’s String Quartet in F major, Op.18, no. 1. The instrumental Brahms owes much to Beethoven, who brought many innovations to his musical genres, not the least of which was the systematic use of interlocking thematic devices to achieve intra- and inter-movement unity in long compositions. The six quartets that make up the Op. 18 set were Beethoven’s way of announcing to the world that he was to be taken seriously as a composer. It was evident that the musicians viewed the work not as the apogee of 18th Century Viennese Classicism, but rather as a transitional work that looked forward to the composer’s middle period. That approach was made plain in the slow movement, which was presented as a deeply felt lament. Here Beethoven goes far beyond Haydn, writing in an emotional intensity — the movement is his musical depiction of the tomb scene of “Romeo and Juliet” — that must have shocked his contemporaries. The finale was energetic and incisive, elegant and charming. Guest artists Hirono Oka (violin) and Marcantonio Barone (piano) collaborated in a tour de force rendering of Stravinsky’s Suite Italienne, a 1930s work arranged from the ballet Pulcinella. Stravinsky based Pulcinella on music that had been attributed (probably erroneously) to the 18th Century Italian composer Giovanni Pergolesi. The result is not an antiquarian piece but a seamless fusion of the old and the new. Stravinsky maintained the courtly character of the Baroque melodies but spiced up the music with pungent harmonies and updated rhythms. Oka and Barone respected the 18th Century influences in a refined performance full of spongy Baroque rhythms. 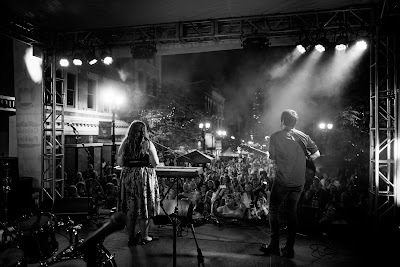 But they also played with ample color and expression, making the music sound decidedly contemporary. Oka’s tone was both sweet and luminous and decisive. The lighthearted character of the Suite Italienne gave way to the symphonic grandeur of Brahms’ Piano Quintet in F minor, Op. 34. Brahms published the work when he was 32 years old, but by then it had gone through several transformations: it began as a string quintet in 1862 and was rescored as a work for two pianos until Brahms gave it its final form. This is a work of surging passion, tempered only momentarily by the softer-edged Andante. Govatos, Oka, Chen, Newman and Barone conveyed the full-bodied Romanticism of the two outer movements and the driven Scherzo and a plaintive, soulful rendering of the slow movement. Yet as heated as the music got, the ensemble kept the texture remarkably transparent. Viola and cello lines were never buried yet the group produced a solid, powerful sound. On Saturday, June 24, concertgoers headed to the Episcopal Church of Saints Andrew and Matthew in downtown Wilmington for a free concert, marking the first collaboration between the DCMF and the residents of the Boysie Lowery Living Jazz Residency. Six residents were given a week to compose a work that incorporated a classical string quartet — a first for these talented young artists. Each composition was noteworthy but Sasquatch by vibraphonist Grady Tesch brought down the house. Tesch also excelled as a featured player in Mike Talento’s Half and Half and as lyricist and vocalist in Ike Spivak’s Plot Twist, which recounted the musical journeys of jazz luminaries. Jazz vocalist Isabel Crespo gave a plaintive rendering of her composition Hide and Seek, while trombonist Kristin Monroe ably combined elements of jazz and classical in Coasting Equilibrium, her contribution in the tradition of Astor Piazzolla’s nuevo tango. Libby Larsen kept the musicians moving — especially pianist Julie Nishimura — with the kinetic energy of Four on the Floor. Tina Betz, also executive director of the Light Up the Queen Foundation, applied her dramatic contralto to a powerful rendering of Strange Fruit, a song about lynching made famous by the late Billie Holiday. Douglas Mapp, associate principal bass with the Delaware Symphony Orchestra, joined the string quartet to accompany. The song was arranged for this performance by Boysie Lowery director, Jonathan Whitney. Sunday, June 25’s program opened with Mozart’s Divertimento in D major, K. 136, the first of a group of works known collectively as the “Salzburg” symphonies. The work was performed at the request of DCMF Board President Carolyn Luttrell. Govatos, Oka, Chen and Newman played with a nimbleness and precision that underscored the decorous elegance of a work that can only be described as a masterpiece on the smallest possible scale. Pianist Natalie Zhu joined Govatos, Chen and Newman in a seductive and sensitive performance of Joaquin Turina’s Piano Quarter in A minor, Op. 67. Composed in 1931, this gently melancholic work resonates with the vivid harmonies and impetuous rhythms of Spanish folk music yet at the same time bears the imprint of impressionists’ influence in its spacious, colorful textures. The program — and season — concluded with a performance of Brahms’ breathtaking Quintet in G major, Op. 111. Orchestra in conception, this piece creates the effect of far more than five players. This was a passionate performance. Cellist Newman was more than equal to the full opening of the first movement. The Adagio was rapt intensity; the Allegretto wistful and the finale, robust. The Delaware Chamber Music Festival (DCMF) opened its 2017 season on Friday, June 16 with a celebration of the music of a composer many find difficult to love: Johannes Brahms. Indeed, the “Brahms problem” never seems to go away. Over and over, we hear complaints that his music is “too romantic,” albeit not excitingly romantic like Chopin or his mentor Schumann. At the same time, he’s charged with being too intellectual and not sensuous enough. One thing, however, is certain: Brahms’ oeuvre occupies a unique position in the history of Western music. Looking Janus-like both to the music of the past and towards the innovations of future generations, Brahms’ music has shaped our understanding of composers from the Renaissance and Baroque periods to the present-day. Violinist and DCMF Artistic Director Barbara Govatos has curated a series that acknowledges the tensions between modernism and tradition. Each of the four concerts offers a master work by Brahms as well as works by Schubert, Mozart, Beethoven, Stravinsky and others. The level of playing was extremely high. 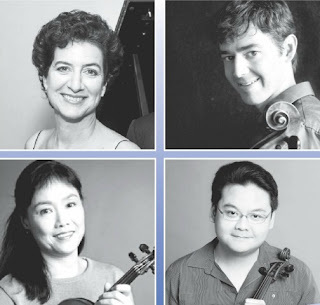 The Festival Quartet — Govatos, Che-Hung Chen, viola, Hirono Oka, violin — includes musicians of the Philadelphia Orchestra. Guest artists for the first weekend of concerts included pianists Marcantonio Barone, Julie Nishimura and Natalie Zhu. Govatos, pianist Natalie Zhu and cellist Clancy Newman delivered a performance that truly highlighted character of the movement titles: subtle and relaxed for the first, energetic and rhythmically decisive for the second. Perception is personal but if audience response was any indication, both musicians and composer succeeded in achieving the two vastly contrasting moods. Violist Che-Hung Chen then joined Govatos and Newman in a performance of the Serenade in C major for String Trio by Hungarian composer Erno Dohnanyi. Dohnanyi became a devotee of Brahms while studying at the National Hungarian Academy of Music. Brahms would later promote the fledgling composer’s first published composition, the Piano Quintet in C minor. Govatos and company offered an impressive performance of the Serenade characterized by a warm tone, a relaxed demeanor and the ability to search out the subtler aspects of the score. Zhu rejoined the ensemble following intermission for a performance of Brahms’ Piano Quartet in G minor. The work premiered in Hamburg in 1861 with Clara Schumann at the piano. It was orchestrated in 1937 by Arnold Schoenberg who would call Brahms “the reluctant revolutionary” for the way he developed his thematic material, techniques for which Schoenberg himself would become famous. The ensemble gave a reading that conveyed both the sweetness and simmer of the first movement; the introspective character of the second and the dreamy grandness of the third. The Hungarian, Rondo finale was pure fire, the rhythmic and metric complexities so meticulously executed that the audience rose to its feet with gasps of delight and thunderous applause. Sunday’s program opened with the Fantasie in F minor for piano, four hands by Franz Schubert. Not a bad choice, since Schubert was one of Brahms’ favorite composers, so much so that he cast the aforementioned piano quartet in the Schubertean mold. Schubert was after the Mozart the major composer of original four-hand piano music. The Fantasie comes from the last year of the composer’s life. It consists of four movements of unequal proportions. Guest pianists Julie Nishimura and Marcantonio Barone played as one entity, making very clear the architecture of the piece yet never obscuring the wonderful niceties like Schubert’s amazing sense of harmony and canonic writing. Govatos and Barone did justice to the passion and pathos of Francis Poulenc’s Sonata for Violin and Piano, a work dedicated to the memory of Spanish poet, playwright and theatre director Frederico Garcia Lorca, who was murdered by Nationalist forces at the beginning of the Spanish Civil War. Although Poulenc railed against a “prima donna” violin above an arpeggio piano accompaniment, he followed Brahms’ example in this work by giving each instrument a challenging yet balanced part. Govatos, Barone and cellist Clancy Newman concluded the concert with a rendering of Brahms’ Piano Trio, No. 2 in C major. The three musicians gave the work the disciplined and coordinated interaction its complex lines demand and judging by audience reaction, achieved the desired result. The Delaware Chamber Music Festival continues Friday, June 23, 7:30pm and Sunday, June 25, 3:00pm at Wilmington Friends Lower School. A Saturday, June 24, 4:00pm FREE Jazz Concert will also be performed at the Church of Saints Andrew and Matthew, in collaboration with the Boysie Lowery Living Jazz Residency Program (Jonathan Whitney, Director. For full details, visit www.dcmf.org. 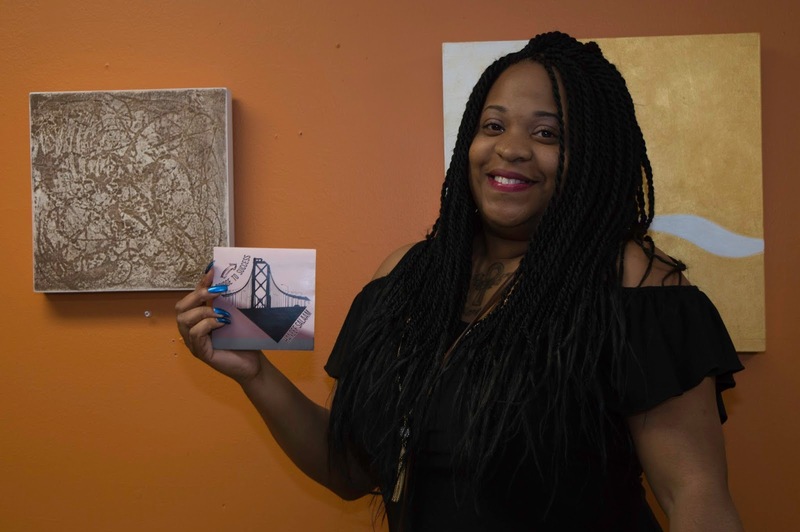 This post courtesy of guest blogger, Jasmine Brown, Jasmine is the owner of 8th Avenue Collective Group, a creative agency based in Wilmington. 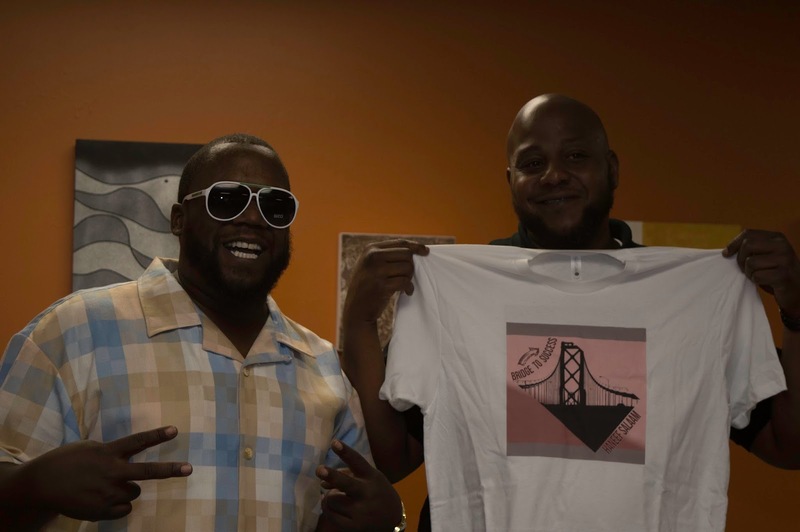 Haneef Salaam is a rapper from Southbridge in Wilmington. His music is uplifting and motivating, which makes anyone be able to relate to it. We suggest playing his debut album Bridge To Success first thing in the morning while getting ready for the day. It will certainly change your perspective. On Thursday, June 15, the room at ArtzScape was filled with Haneef’s family, friends and supporters. 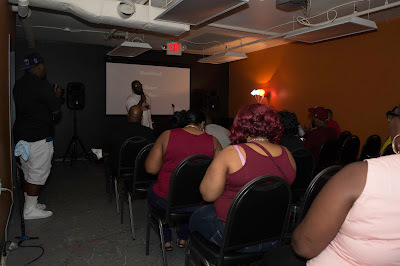 People from all walks of life came to check out Haneef Salaam and his inspiring music. Light refreshments were served to guests as they sat and listened to Haneef’s curated selections from his album. The night was broken up by two intermissions, raffles and interviews. Overall, it was a relaxing event with people networking, mixing and mingling over great food and even better music. 8th Avenue Collective Group is a creative agency that helps artists, makers and doers create and share in their communities. They provide a digital and physical platform for creatives to network and broaden their horizons in order to reach goals and maximize potential. Its next event is Paint & Chill on Friday, June 30, 2017, at 5:00pm. It will be a relaxed evening of painting. No instructor, so guests can paint what they wish as they listen to music and enjoy light refreshments. Location is Artist Ave Station, 800 N. Tatnall Street, Wilmington, DE 19801. 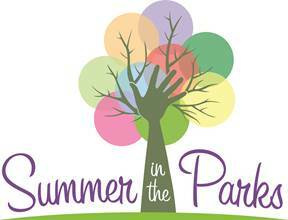 Wilmington Mayor Mike Purzycki and The Grand Executive Director Mark Fields today announced details about the fifth season of Summer in the Parks, a series of interactive cultural experiences provided free in Wilmington’s neighborhood parks. The program, a collaboration between the City and The Grand, will feature more than 60 events in 13 parks and public spaces across the city. Each week, Summer in the Parks will feature cultural programs on a fixed schedule in eight city parks, including Haynes, Tilton, Holloway, Woodlawn, Prices Run, Barbara Hicks, Judy Johnson, and the Helen Chambers Playground. In addition, each week will feature a more traditional concert during the early evening. While The Grand serves as producer for the innovative program, it draws on a wide variety of artistic talent from Wilmington and the region. All of the Summer in the Parks activities are designed to be more than presentations or performances by including some component of audience participation or interactivity, such as storytelling, theater, art, music, dance, and crafts. Summer in the Parks will showcase a total of 191 individual artists this summer representing 32 cultural organizations and groups. A full schedule of daytime and evening activities can be found on The Grand’s website. Featured artists include: Almanac Dance Circus Theatre, ASCAB Capoeira Delaware, Delaware Art Museum, Delaware Contemporary, Delaware Shakespeare, First State Ballet Theatre, FLYOGI, Found Art Fun, GCJ Uniques, Griots Wa Umoja, Illstyle & Peace, Janina Williams World Music, LaFate Gallery, Maya Belardo Music, Minas, Music School of Delaware, Philly Vibes, Pieces of a Dream, TAHIRA, Walt the Street Dog, Warm Hugs Good Hearts, Wilmington Drama League, Yoco Knit Shop. To kick off summer, the Delaware Art Museum is hosting Happy Hours every Thursday --- June 29 through September 14 --- from 5:00-7:00pm on the Museum's back terrace in the Copeland Sculpture Garden or in the Thronson Café during inclement weather. Drinks and food specials will be provided by Toscana, the Museum's exclusive caterer. Special themed Happy Hours will take place on select dates throughout the summer. On June 29, July 6, and July 13, guests will enjoy local musician Seth Tillman on vocals and acoustic guitar. On July 27, the Museum will host a special Game Night featuring bean bag toss, Jenga, and other outdoor games. On August 31, visitors are invited to bring their four-legged friends for Doggy Day Happy Hour, with special dog treats included. All dogs must be leashed during the event. Visitors are also invited to enjoy the special exhibition The Original Mad Man: Illustrations by Mac Conner (on view June 24-September 17) and retro-inspired cocktails Thursday evenings. This comprehensive and lively installation explores the work of one of America's original "Mad Men." McCauley ("Mac") Conner (born 1913) created advertising campaigns for a variety of products during the decade when the advertising industry was at its height and centered on Madison Avenue. Mac Conner's illustrations for leading women's magazines such as Redbook and McCall's animated a wide range of popular literature, from romantic fiction and detective stories, to topics of import such as Cold War anxiety and juvenile delinquency. His work is a "time capsule" of an era when commercial artists helped to redefine American style and culture. Always on view are the Museum's renowned collection of British Pre-Raphaelite art and the spectacular collection of American art and Illustration. The Thronson Café is open Wednesdays, Fridays and Saturdays, 11:00 a.m.-3:00 p.m., Thursdays, 11:00 a.m.-8:00 p.m., and Sundays, 10:00 a.m.-4:00 p.m.
Dan holds a BA in Theatre Production from the University of Delaware and has studied theatre around the world. Dan has worked extensively both onstage and behind the scenes across the Mid-Atlantic Region with theaters such as Three Little Bakers, The Candlelight Theatre, the Philadelphia Theatre Project, The Milburn Stone Theatre and Phoenix Festival Theater. And, boy, does it! 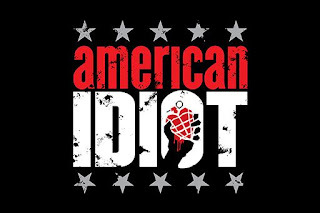 Based on Green Day’s 2004 album American Idiot, Director Chris Turner brings the show to life on the Wilmington Drama League (WDL) stage with a cacophony of song and dance in a story of love, loss and redemption. Originally conceived as a rock-opera by Green Day frontman Billy Joe Armstrong, the band had always intended for this music be performed on stage a la The Who’s Tommy, and used their 2004 album release as a sort of demo. Flash forward to September 2009: The show is running at the Berkeley Repertory Theatre, California. It was then transferred to the St. James Theatre on Broadway where the musical officially opened on April 20, 2010. The show closed on April 24, 2011 after 422 performances. The musical won two 2010 Tony Awards for Best Scenic Design of a Musical and Best Lighting Design of a Musical. It was also nominated for Best Musical that same year but lost out to Memphis. In 2011, the Broadway Cast Recording of American Idiot won a Grammy Award for Best Musical Show Album. The basic storyline of American Idiot is flimsy but familiar: Three young suburbanite kids get bored/feel trapped with their mundane lives – as well as mommy and daddy’s rules – and decide to break free. Subsequently, one (Will, played by William Bryant) stays home after finding out his girlfriend, Heather, is expecting. Another (Tunny, played by Ben Long) joins the military and is shipped off to war. And, in a role originated by and named for Wilmington native Johnny Gallagher, Jr. (Original Cast of Spring Awakening. TV & Film: The Newsroom, 10 Cloverfield Lane) is Brandon Zebley as Johnny, who yearns to break free and live a less than humdrum life, ultimately turns to drugs. Rounding out the cast of Wilmington Drama League production is an energetic bunch of local talent: Alexander Cook, Gina Dzielak, Kendra Eckbold, Marion Jackson (Heather), Daulton Mahley, Darby McLaughlin (Whatshername), Ty Pride (Extraordinary Girl), Felipe Rocha, Chrissy Stief and Shane Wilson. Tony Delnegro’s interactive set features multiple levels, a plethora of flatscreen TVs, graffiti, and gives a sense of an urban everywhere and a dystopian nowhere, providing an ample playground for the shows many locales. Combined with smart lighting design by Aaron Cook and Brian Kavanaugh, this production also employs two projectors focused on the walls of the house to immerse the audience in a world of ever-changing imagery – by Banksy, a city skyline and more – to set the mood perfectly. The choreography by WDL perennial Dominic Santos manipulates tribal-like movements and punk-rock head-banging to evoke the angst and feelings of disenfranchised young adults. Standout performances among the talented cast come from the ladies opposite of our main character trio; Marion Jackson as the pregnant and disappointed Heather; Darby McLaughlin as the sultry vixen Whatshername; and Ty Pride as the Extraordinary Girl. Each of these young ladies have angelic voices that effortlessly soar through each song they belt. The real highlight of this show, however, is the band who rocks out on this non-stop wave of music with the energy and vigor of an actual Green Day concert. But, of particular note, is Music Director/Band Leader, Caty Butler. This young talent takes the stage for the first time in American Idiot as the enticing smack dealer St. Jimmy, a role traditionally played by a man and one she only stepped into a week before opening. Butler outright owns this role and commands the stage with her vocal prowess. I look forward to watching her continue grow as a musician and wait with baited breath to see her onstage as an actor again. Though I did over hear an older patron ask, “What the hell did I just watch?” after the show, I would say that’s a good indication that this ain’t your NaNa’s Broadway and highly recommend checking out the charismatic production of this high-concept rock-opera before it’s gone. American Idiot at the Wilmington Drama League runs through June 18. Tickets are available via the Drama League website www.WilmingtonDramaLeague.org or via phone at 302.764.1172. Photo courtesy of Delaware Humane Association. Calling all local artists! 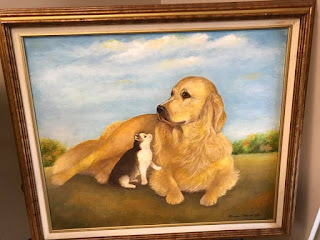 Delaware Humane Association (DHA) is looking to display pet-related art (but pet-related themes are not required) in its new storefront adoption center in Rehoboth Beach, Delaware. The goal is to display and sell works onsite, with a portion of sale proceeds benefiting DHA. An exhibit opening or reception could be a part of the submitting artist's agreement. 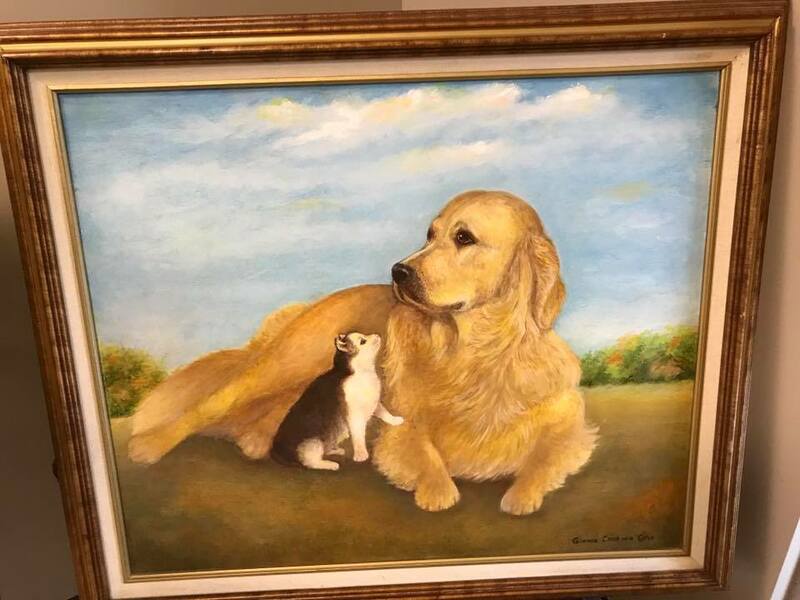 Delaware Humane Association will display a different artist's work for varying periods of time. If you are interested or know someone who may be, please contact DHA's Adoption Center Manager Jody Rini at JRini@delawarehumane.org.